Under the direction of Sarah Boulter and Lisa Bowmer, Ev & Bow has a reputation of supreme quality. It is the premiere studio for innovation, passion and outstanding results. Ev & Bow is leading the way in the dance Industry with cutting edge choreography and professionalism. 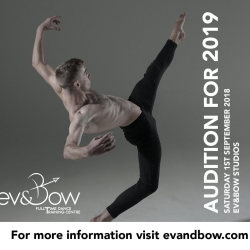 Ev & Bow selects exceptional dancers into a nurturing environment providing personal care and boasting limited class sizes. It is Ev & Bow’s mission to provide quality training to enable the dancer to be a versatile and valuable member of the dance industry. To broaden their knowledge, creativity and respect for their craft. SUBJECTS: Classical ballet, contemporary, choreography, pas de deux, repertoire, jazz, acting, singing, musical theatre, acrobatics, hip hop, develop yourself as an artist, personal training and professional development. CAREERS: Dancers graduating from this course have secured jobs with Australian Dance Theatre, Legs on the Wall, Cats, The Lion King, Mod Dance Company, Opera Australia, West Side Story, Royal Caribbean cruises, Princess Cruises, Celebrity Cruises, Disneyland, Universal Studios, Circus, the Dream Dance Company and a variety of television commercials and film.